"The Animal Parables offers a unique look at the endearing world of animals. Martin Day is a gifted guide spinning illuminating stories that will thrill and enlighten the child in all of us." "Over the last two decades I have had the privilege of watching Martin use his artistry and gifts of communication to convey complex material in a way that is easily understood by young and old alike. This lovely book is further evidence of this skill. Cleverly weaving deep issues like self-worth, legalism and personal identity into stories that both touch the heart and make you smile"
A dog who gets hold of the wrong end of the stick; a horse who beats the odds; a wasp who discovers a sting in the tail. This is the stuff of The Animal Parables. Each tale features an animal who finds that things turn out to be quite different from how it imagined and profound life lessons are learned along the way. These seven, life affirming, tales will delight young minds and leave adults moved to reflection. In this collection Martin Day has re-discovered the power of the parable to layer deeper meanings under the skin of a simple narrative. In doing so he has created a collection of stories that sound at multiple levels. It’s like the delight of finding that second tray under the first in a box of chocolates! These short stories are an average 2973 words long and take between 17 and 25 minutes to read out loud. This collection is also available separately as individual short stories for kindle. 5.0 out of 5 starsdelightful little book, for children and adults. I bought this book recently, thinking I would read it to my 9 year old, but I so enjoyed reading it myself that I would recommend it for children teens and adults too. 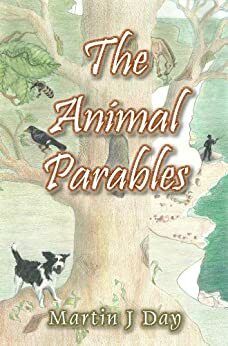 It is a collection of "parables" or short stories about individual animals/insects/birds which find themselves unloved, in need or just searching for answers to their existence. There is the Mynah bird, who is envious of the other birds and their beautiful song and plumage, who learns a lesson the hard way that it is better to be who we are meant to be, and not try to be something else. And the Caterpillar, who believes the spiteful dragonfly when it tells her she will never be anything other than fat and ugly, until the butterfly tells her "You must give up your self serving heart, and your destructive habits. You must throw off the layers that cover who you are. You must die to yourself". I loved them all, but I think my favorite was "The Dog". The touching tale of a little puppy, desperate to please it's new Master, but constantly tempted by the delights of the world. The Masters gentle rebuking and the dogs eventual understanding that he would be loved, no matter what he did, brought me to tears. Thank you Martin Day for a wonderful book! This book is a great take on parables and thought provoking for adults and children. A brilliant read and great for a bit of friendly debate and quality time with your kids.